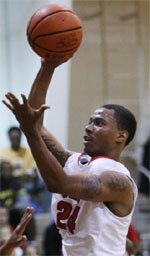 Yakima Sun Kings agreed terms with 26-year old guard Andre Winston (185-77kg-92, college: Southeastern). The last time (16-17) he played at Erdene Orkhon in Mongolian Superleague. Winston missed last season and had one year break from professional basketball. The list of the past achievements is quite long as among others Winston's team won Mongolian Superleague Regular Season in 2017. He was selected to Mongolian Superleague All-Star Game in 2017. Winston's career allowed him to visit three different continents. He tasted the life as pro basketball player in Europe, Australia and of course North America. Winston has played previously professionally in Australia (Canberra City Stallions), Latvia (Ventspils) and ABA (Seattle Mountaineers). He attended Southeastern University until 2015 and it will be his fourth season as a professional player. On Winston: A person of very high character with tremendous athletic ability and outstanding combo guard skills. This was about much more than simply having more talent. Certainly the Yakima SunKings were probably the North American Premier Basketball League's best team in that department. But what defined this team's run to the first TBL championship was its unselfishness; the ability for players to check their egos and cheer for their teammates while sitting on the bench. That was never on better display than Saturday in the SunDome. In the first half, reserves Brent Schuck and Stephen Battle shook Yakima out of an offensive funk as Albany seemed poised to run the SunKings out of the building. Then in the fourth quarter, with a determined Patroons team refusing to go away, Robert Duncan and Cedric Jackson provided the jolt the SunKings needed. The two scored 13 of Yakima's first 17 points in the quarter and Duncan hit a big 3-pointer to spark a game-clinching 12-0 run as Yakima prevailed 112-97 to sweep the best-of-three series. 'That epitomized what we are as a team,' Yakima coach Paul Woolpert said. 'When Tyler (Thornton) got his fifth foul (early in the fourth) I was concerned. But as has happened all year, other players responded. Duncan scored nine points and Jackson had eight in the fourth quarter, while Duncan also provided a defensive spark as Yakima held Albany scoreless for 31/2 minutes to turn an 89-87 Yakima lead into a 101-87 advantage and all but lock up the game with 4:06 to play. One of the key plays in that run was a steal by Duncan when he went up high to intercept an entry pass to Deandre Thomas in the low post, leading to a fastbreak layin by Renaldo Major. 'He's been big-energy on both offense and defense and we all feed off that,' Jackson said of Duncan. 'Robert is a tenacious defender,' said Major, who put the finishing touches on his finals Most Valuable Player performance by scoring the final five points in that decisive run and nine in the final quarter to cap a team-best 20-point performance. That grit first emerged Saturday when Yakima fell behind 39-22 early in the second quarter. But Schuck and Battle, along with Duncan and Thornton, helped to quickly reverse the momentum. Battle scored 10 points and Schuck nine in the period, with Thornton providing six and Duncan four in a massive 17-0 burst that got Yakima right back in the game. Major scored nine points in the third to help the SunKings take a 79-77 lead into the fourth, setting the stage for the clinching momentum swing in the latter half of the period. In the end, a scan of the box score shows the multitude of contributions. In addition to Major and Thornton, Jackson just missed a triple-double with 20 points, 11 assists and nine rebounds, while Duncan had 15 points, eight assists and six rebounds. Mac Koshwal had 10 points and 10 boards, and Robert Upshaw had 11 points, with everyone who saw action making a significant impact at some point. David Magley knew he'd endure them when he started the North American Premier Basketball League and he was right. Almost halfway through this inaugural season, the league has had its share of ups and downs, but the TBL president expressed confidence that most of the league's biggest challenges are now behind it. 'I'm probably guilty of over-shooting expectations,' he said Sunday, prior to the Yakima SunKings' game against Albany in the SunDome. 'But if I take a step back, I see we're at the halfway point of the season and we've got one really great franchise (Yakima) and a bunch of good ones. There's no question in Magley's mind that Yakima is the league's strongest franchise and the model he wants all the others to emulate. 'This has become absolutely where we need every team to be,' he said, adding that the league could use more people like Yakima coach and general manager Paul Woolpert and former GM Rich Austin. Unfortunately, a couple of teams are falling short of the Yakima model, with Vancouver being the most obvious. The league took control of the team last week, removing the team to prevent further damage to a market Magley desperately wants to hang on to. The Knights will finish the season, with their remaining home games to be played in Columbus, Ohio, except for three against Yakima, which have yet to be rescheduled. Magley expressed confidence that the team could return to Vancouver with a new owner next season. Magley was candid assessing his own role, admitting that there were more challenges than he originally anticipated and vowed to make changes. After an abbreviated three-month run-up last fall to get the league started, Magley said it will be important to take advantage of the full offseason ahead to not only bolster current franchises but bring new ones on board. In addition to Vancouver, he said the league wants to get local owners for Kentucky and Nevada and additional owners for others, firmly stating that he won't allow unstable teams to damage the league's overall health. 'All current teams need to be shored up by August 1 or they will sit out next season,' he said, adding that the league will expand next season, including a team in Bellevue with efforts to put one in Spokane as well. Creating pods around existing teams is a primary focus since that will help reduce travel costs, Magley said. 'The net result is we'll have a stronger league next year,' he said. 'It's finding a way to tie things together that benefit the league.